The client settings window can be accessed by clicking on the gear icon in the lower right part of your game screen. This will popup a new window in your browser. There are 10 tabs in the settings window. The Display Options tab controls most of the basic settings of the client. Most options will demonstrate what will happen in the preview window to the right as they are checked and unchecked. 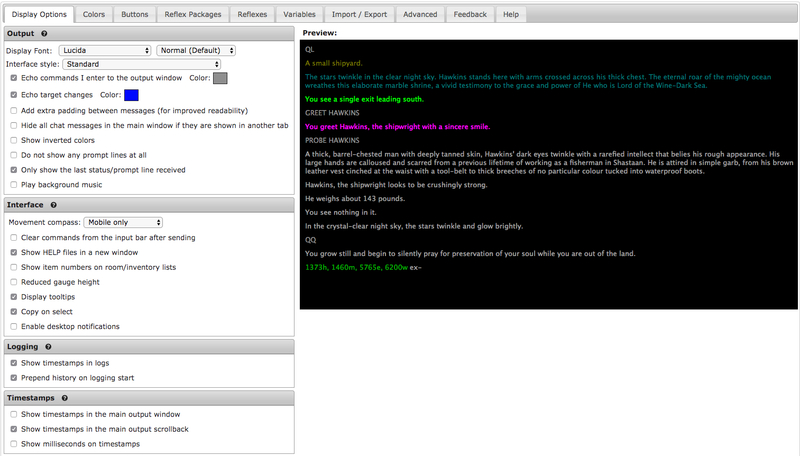 Display Font: You can change the font and the font size used by the client. Interface Style: This allows you to change what the client looks like. Currently you can select between standard and minimal, which is shown below. 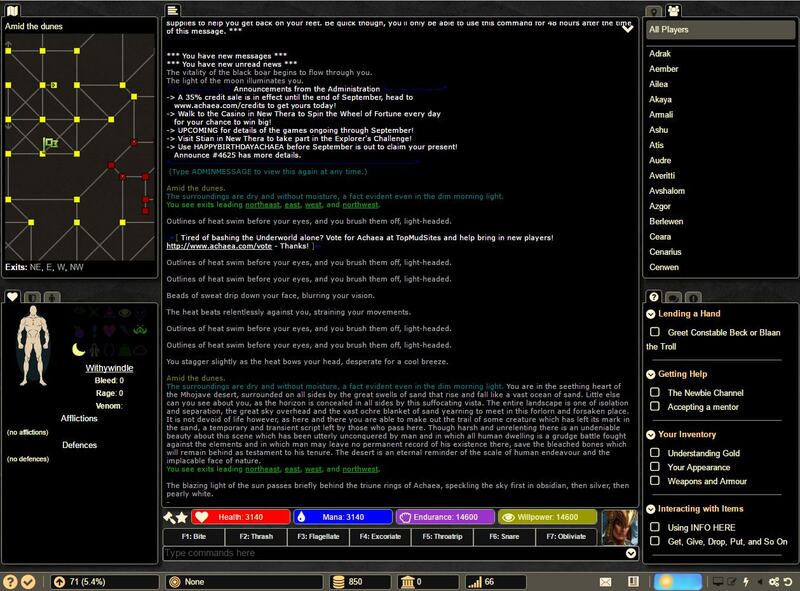 Command Echo: When you type a command into the game to can opt to not display it. You can also set the color. Echo Target Changes: When you target something in the game, you can have it display that information. Add extra padding: Adds additional whitespace between lines, making it easier to read. Hide Chat Messages: You can opt not to show any chat messages in the main window. Chat will always display in the communication window. Show Inverted Colors: Invert the colors in the client. This will switch the black background to white. Prompt Lines: You can opt not to see your prompt at all. Your prompt typically displays health, mana, and balance. Although this varies from game to game. Only show the last prompt: Only display the most recent prompt at the bottom of the main display window. Plays Background Music: You can turn on/off the background music in the client. This does not effect other client sounds. Movement Compass: Select your preference for displaying the movement compass in the client. Clear commands from the input bar after sending: This will automatically clear your command line after you press enter. Show HELP files in a new window: When looking at help files, a window will popup to let you read them. Show item numbers on room/inventory lists: When checked, this option will display the unique item number for all items in the game in your inventory and room windows. Reduced gauge height: This options will reduce the height of the gauges in the client, allowing more room for the output window. Display tooltips: Hide or display tooltips when hovering over parts of the main client window. Copy on Select: When copying text from the output window, it will automatically be copied to your computer's clipboard. Enable desktop notifications: This will notify you when something is happening in the game when the client isn't the active window/tab. Show timestamps in logs - Toggle whether to show timestamps in logs. Prepend history on logging start - Add what is already in your output window to the top of the log when you start logging. Show timestamps in the main output window: Display the time that each line in the game is received. Show timestamps in the main output scrollback: Display timestamps on each line when scrolling up the main output window. Show milliseconds on timestamps: Display timestamps down to the millisecond. This window will allow you to set the colors sent from the game to the Nexus client to whatever your heart desires. Nexus can have 6 to 12 buttons placed directly above the command line based on your preferences. When you character is first created it is populated with some basic commands. The buttons tab, allows you to set the number of buttons displayed and edit what each button does when clicked. Below is an example of the button bar in the main client window. This tab will allow you to install packages from other players. Packages is a term used to describe groups of reflexes. By default all characters come with the Numpad movement package. This package allows you to use the numpad to move around the game world. If you would like to create your own package, click 'Add a package' and assign reflexes to that new package in your reflexes tab. Reflexes is an indepth subject and can be fully explained on its own page. A variable is alphabetic character representing a value or text that may be used in a reflex. For example, a user may store the number of a pack or the name of the last player that attacked them. 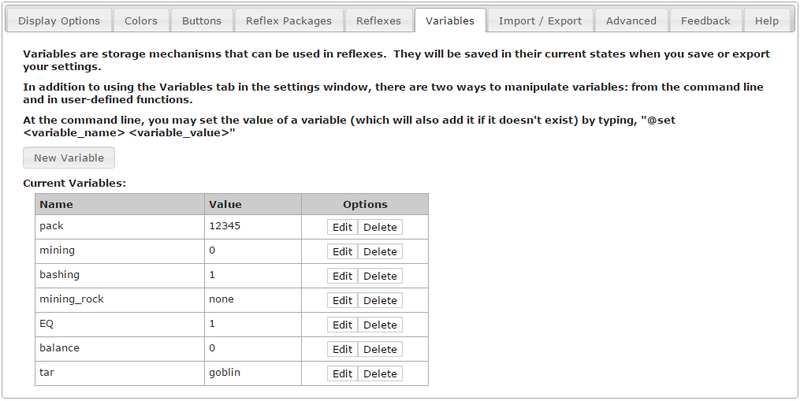 Variables can then be used by other reflexes by using the @ symbol and the variable name. For example, from the image below, @pack would be replaced with my pack number, 12345. @tar will be replaces with goblin. Your characters settings are saved on the game servers. This means that no matter what computer you play from, your character will load its latest settings. There may be instances where you want to backup your settings. Especially if you are about to make radical changes to your reflexes and system. In that case, this tab will allow you to save your current settings you your own computer or load any settings you have previously saved. WARNING: If you load previously saved setting from your computer, you will overwrite any changes you have made. Additionally, we keep a backup of your settings from the last 9 days, allowing you to revert to an older version of your settings. Most of the advanced settings are never used. Explanations for the settings are below. Echo all GMCP messages: This will display all GMCP messages. This will be very spammy and is only needed if you are trying to debug problems. Echo trigger execution: This will echo all triggers as they happen. The more reflexes your character has, the more spammy this will be. Again, this is for debugging purposes. Scrollback Limit: The more text stored in the scollback the more laggy the client can become. Increase at your own risk. Command Stack Delimiter: You can send multiple commands to the game by separating them with this character. By default is it the | character. Hate us? Love us? Have a suggestions? Found a bug? Please send us your feedback. Some basic help on importing, exporting, saving, and loading your settings. This page was last modified on 18 March 2018, at 17:08. This page has been accessed 58,641 times.